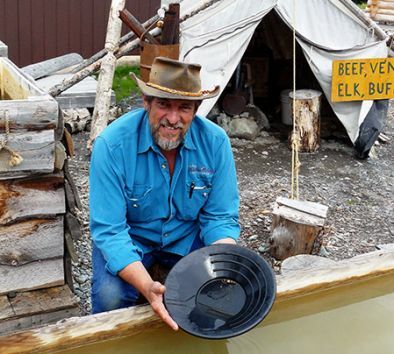 Try your hand in gold panning at Prospector John’s Gold Panning store in rustic Cooper Landing—a town rich in gold mining, early settlers and Alaska Native history. This tour takes you back to the days of the Gold Rush as Prospector John takes you through the steps of modern and old-time gold panning techniques. After a quick panning lesson, you’ll pick up your free treasure map and receive your own poke (a full bucket) filled with rich pay dirt from a working Alaska mine area. Next you’ll learn how to use a sluice box (panning this much pay dirt by hand might take you several hours). Finally, you’ll collect all your black sands and heavy concentrates so you can pan out and uncover your gold. Your “find” will be placed in a glass vial for you to take home as a memento of an experience you’re sure to treasure. Dress in warm layers. Wear sturdy, comfortable walking shoes.